I've been adding a few new Soul Mantras to the shop. First up is this feather bracelet. For months, Bonnie (my studio assistant) and I have been dreaming of a bracelet made with this huge feather. We finally made it happen. It comes in three sizes so it will be sure to fit your wrist. It includes a quartz crystal bead to promote clarity and all around daily support. I've also paired the large feather with a stack of three raw fluorite gemstones. The colors make me so happy! You can find it right here. You can actually wear this necklace three ways because you can easily take the feather or the fluorite off of the chain and wear them individually (or add them to other Soul Mantra necklaces). These fluorite drops are all a bit different and range in color from light blue to swirls of purple and green. Just a few of these left. 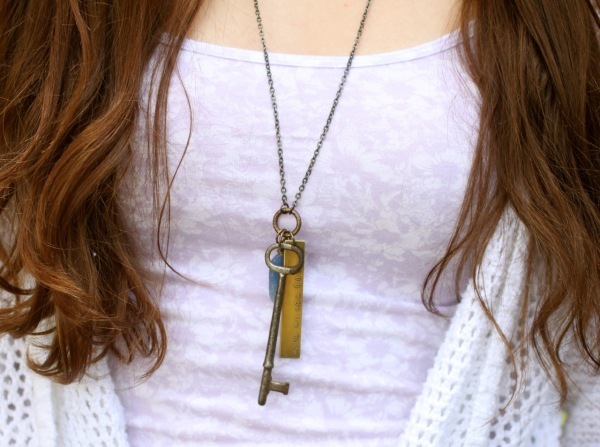 A new batch of key necklaces is also in the shop. All these vintage keys are from an antique store in Iron Mountain, Michigan. Ellie and I found them while we were visiting my mom this spring. Love sending out these pieces of Midwest history. Each one is a little bit different and some even include numbers (each individual description indicates this). They are paired with a brass Soul Mantra that says "open up and live" and a kyanite gemstone to help you speak your truth. And we have more Sleepy Moon earrings available. I wear mine just about every day. And for the first time since opening my shop seven years ago, I'm already dreaming up the collections I'll be sharing for fall and winter. The plan is to add more gemstones and a few other good things. Thank you so much for supporting my shop so that I can live these dreams and share my message in this concrete way that puts love from my studio right into your hands.